Sickness strikes us a fourth time! This has been a pretty hellacious week in terms of sickness at our household. As readers may recall, Oliver has already went through Croup and now is fighting off pneumonia. Sarah has had the flu now for a few days and today it got worse. She now officially has bronchitis. Yeesh. What’s next? Our son’s Croup is, more or less, behind him. However, his fever came back with a vengeance yesterday. His temperature was consistently around 102 degrees, and hit 103 at one point. He was up a good part of the night. Because my pregnant wife has the flu and also is running a fever, I took the day off to play doctor/nurse. This morning, I took Oliver to see his pediatrician. We were sent down for a chest X-ray and the results show that Oliver has pneumonia. Scary. He spent most of the day sobbing and repeating “Momma, momma, momma” over and over. At one point, I held him on the couch and put on some children’s programs. He clung to my chest tightly for almost two hours and even slept on me for about half an hour. It was kind of sweet, since that hasn’t happened since he was about four months old. I feel so bad for the little guy. Anyway, he appeared to be a little more active this evening, after his new meds kicked in. I hope tomorrow goes well and that nobody else catches the pneumonia (KNOCK ON WOOD!). Will keep everybody posted. This started Friday, when I received a call from my wife telling me Oliver had a fever. 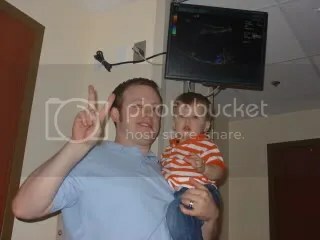 Our first thought, of course, was H1N1, so we made an appointment to visit Oliver’s doctor the next morning. After the Croup diagnosis, he was given a steroid to keep his throat from constricting. The main side effect of said steroid? A cranky toddler. The doctor warned us, but yeeeeeesh, this was unexpected. Yesterday and today, he’s alternated between 20 to 30 minutes of good, sweet boy with about 5 to 10 minutes of extreme crankiness. The foul moods are accompanied by lots of punching and kicking. Yes, I’ve been hit several dozen times, mainly in the face and between the legs. Feel really nice, let me tell you. We had some special guests with us for the past few days. My sister Jen came in town from Minnesota, and my parents drove up from Springfield, Mo., to join us. We had a great time, and everyone seemed really amazed at how much Oliver has grown since they last saw him. On Thursday, we took a walk along the Katy Trail, which is just a few miles from our house. That evening, Jen made an awesome dinner and we played some games together. On Friday, we visited my grandma who lives in south St. Louis County, then headed over to Grant’s Farm. It was really cold, but we bundled up well. Hardly anybody was there, which was nice. I kid you not, I think there were less than 20 people at the park. I believe there were about twice as many employees. And seriously, the employees there are the nicest people in the world. So nice. Oliver had fun riding the new carousel. The workers let us go around twice. Sarah was dizzy after one go-round, so she exited. After the second, the guy said, “You can go again.” I passed, due to some nausea (man am I getting old when a carousel causes me to feel sick!). We then fed the goats, but Oliver whined almost the entire time because he wanted to drink from the bottle. Was kinda funny. After seeing everything at Grant’s Farm, we headed to the courtyard. My sister, father and I enjoyed a few free beers. And we all watched Oliver, who put on a show with some funky dance moves to the polka music blaring from the loudspeakers. We shot a video, though we missed a lot of the good stuff. I’ll post it tomorrow, so stay tuned. On Saturday, Sarah and I had a commitment, so my family went to Old Town St. Charles. And on Sunday, we went to a park. It’s currently my lunch hour on Monday, Oct. 12, and almost exactly the halfway point in my wife’s pregnancy. She’s exactly 19-and-a-half weeks along, and we will be scheduled for delivery during week 39. Time has really flown by. 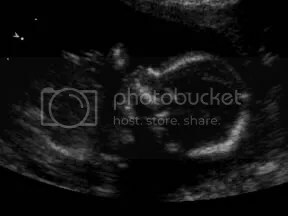 I can’t wait until our next ultrasound, so we can see how our little guy is coming along. Our son, who just turned 19 months old a couple days ago, doesn’t have the most vast of vocabularies. However, he’s starting to talk a lot more lately. Sarah and I wrote down all the words that he says. The list doesn’t include things that he repeats back, but rather words he associates things with and knows what they mean. For example, “mama” references my wife. He can say the word and knows that it refers to her. Oliver is up to about 30 such words. Some are foods (“strawberries,” “Goldfish,” “hot dog,” etc. ); some are pet names (our dog “Molly” and my in-law’s dog “Sage”); and some reference pictures from his favorite books (“gorilla,” “ghost” and “baby,” for instance). A few words crack me up when I hear them, including “shoo fly” (which is accompanied by the pounding of one of Sarah’s flippie-floppies on a window as he attempts to control the insect population) and “poop” (which he yells out in a long, drawn-out fashion when our dog needs to be let outside). My favorite word, though, is “dada.” He screams it out amid giggles while I tickle him, and he calls it out to me until I join him inside one of the many “forts” we build for him on the couch. He also repeats the word over and over and over when I get home from work. There’s nothing sweeter than hearing “Dada! Dada! Dada!” after a long day of work, that’s for sure. Oliver will have a little brother who will be almost exactly two years younger than him. It should be cool to see them grow up, side by side. We went in today for my wife’s ultrasound and found out what we’re having. And yes, it’s a [CAN’T SAY]. We’re excited that our next baby will be a [CAN’T SAY]. Having a [CAN’T SAY] will be really cool. OK, OK. I’ll stop playing around. We did go in today, and we did find out what we’re having. However, Sarah has asked me to withhold from posting the news to my blog until tomorrow night. That’s because her parents have been in Germany the past two weeks and are coming home tomorrow. Sarah would prefer to tell them in person instead of having them find out by reading it in this space. If you can’t wait and are dying to find out, e-mail me. And if you’re a Facebook friend, I did post the big news there.